President John Mahama has tweeted asking Ghanaians to ignore claims by the main opposition New Patriotic Party that it had won the presidential polls by 54%. 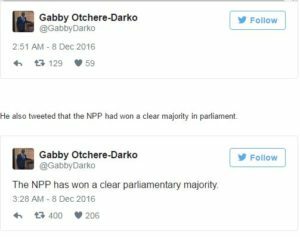 This follows a tweet by Nana Akufo-Addo’s nephew, Gabby Otchere-Darko, that the flag bearer of the NPP has won the 2016 presidential race by 54 per cent. 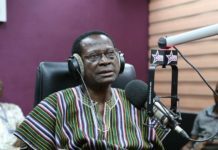 “Results from NPP’s national collation centre so far: We have so far 17,559 polling station results, 60.68%, with 11,508 remaining (39.33%). Nana Akufo-Addo has 55.70%, representing 3,589,131 votes. John Mahama has 2,762,548, or 42.68%. Note. This is provisional but true reflection of pinksheet numbers,” Mr Otchere-Darko posted on Facebook. Mr Otchere-Darko wondered why the Electoral Commission (EC) had not confirmed any results hours after polls ended. 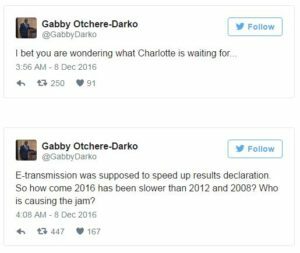 “I bet you are wondering what Charlotte [Osei] is waiting for… E-transmission was supposed to speed up results declaration. So how come 2016 has been slower than 2012 and 2008? Who is causing the jam?” he quizzed in a tweet. 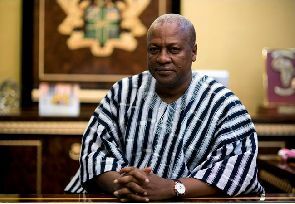 Mr Mahama responded thus: “Ignore Gabby’s post”, the President tweeted. #President John Mahama has tweeted asking Ghanaians to ignore claims by the main opposition New Patriotic Party that it had won the presidential polls by 54%. 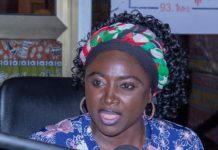 Previous articleNational Democratic Congress (NDC) has lambasted the opposition New Patriotic Party (NPP) for calling on President Mahama to concede defeat to Nana Akufo Addo presidential candidate because they believe he has won the polls. Next articleAccra Mayor Alfred Okoe Vanderpuije has won the Ablekuma South parliamentary contest.